Mediflow is a company that I quickly fell in love with this past winter when I reviewed the Waterbase Pillow! At Mediflow they have sold over 4 million Waterbase Pillows, they are the ideal pillow for anyone suffering from chronic neck pain, sleep apnea sufferers or anyone who is looking to improve their overall quality of sleep. I really have been enjoying my Waterbase pillow from Mediflow. I didn't think it could get any better than that, because it is such a great pillow and I loved it! I slept on my Mediflow pillow every night - that is until the Mediflow Memory Foam Waterbase Pillow arrived at my door! The Mediflow Memory Gel Foam Waterbase Pillow is deigned to fit you perfectly. Just like the Waterbase Pillow, you simply fill the water base as directed and adjust the amount of water to the degree of support you prefer. This pillow can be used as a soft, medium or firm pillow. I sleep like a baby on a firm pillow, so I prefer firm! This pillow features an extra soft top memory foam layer that is infused with Cool Gel & ventilated to stay cool, soft & comfortable all night. The bottom layer features firmer foam springs that provide the support needed to keep your head elevated & your neck straight while you sleep. So far I've enjoyed sleeping on my new Memory Foam Pillow, I can't get over how comfortable it is, it's perfect! So what do you think? Are you interested in trying out the Mediflow Memory Gel Foam Waterbase Pillow for yourself? Feel free to stay connected with Mediflow on Facebook & Twitter! Buy it: Purchase your own Mediflow Memory Gel Foam Waterbase Pillow online for $65.99! 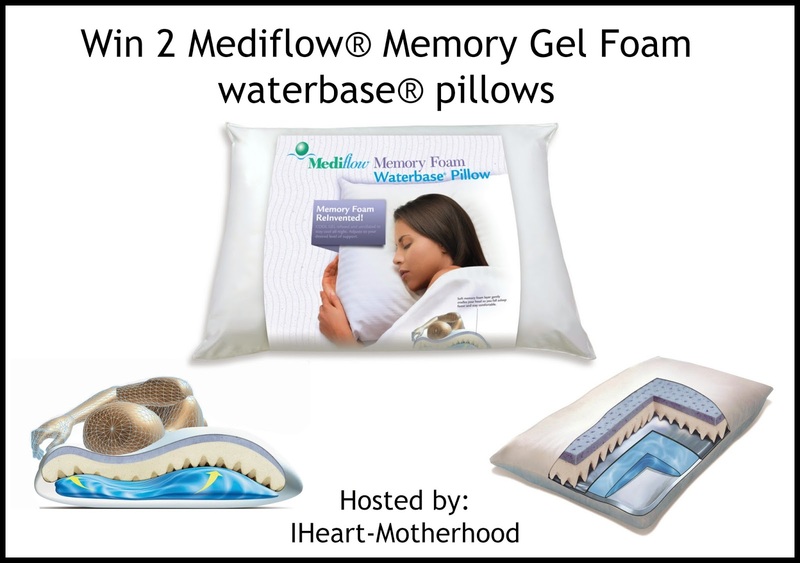 Win it: One lucky reader will win 2 of their very own Mediflow Memory Gel Waterbase Pillows! Disclosure: This giveaway is sponsored by Mediflow. IHeart-Motherhood & Housewife On A Mission are not responsible for prize fulfillment. This giveaway is not affiliated with Facebook, Twitter, Google+, Pinterest or Instagram. This giveaway will end May 6th. Giveaway is open to anyone in the US, 18+ & older. Winners will be posted via Giveaway Tools. No purchase is necessary & void where prohibited by law! I am loving these Memory Gel Foam Waterbase Pillows, they would provide my husband and I with a much better sleep and more comfort. Perfect to sink into and rest your head. This would be for us! I think that this pillow is wonderful and would really help my mom sleep better. I would win it for myself, I could use a new pillow. I think the pillow sounds great, I would like to win it for myself. I would love to see if it would help with my frequent neck aches. I always have upper back and neck pain so I would love to win this for myself! It looks great! I'd love it for my husband and I.